In the centre of the Aegean, where mother nature prevails and the sea reaches its deepest blue, lonely Amorgos, cut off from other famous Cycladic islands, retains its unadulterated charm and becomes a favorite destination for a short numbered elite. 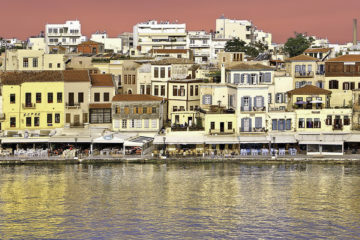 Dressed up in bright sea colors, with Mediterranean flavors bubbling up from times long past and a true cosmopolitan attitude held over the years, Chania is considered to be one of the most atmospheric towns of Greece. Its amazing coastline -one of the best in the Mediterranean Sea- but also its strong mountainous character, hide some famous stunning natural landmarks of a popular summer destination, as it is one of the most accessible by car islands in the country.